Ds is almost 7. Insurance does not cover any evaluations. He has hypermobility in his thumbs. Handwriting is a chore. He has far too much pressure on his thumb when writing. It bends in towards the pencil. Any links to exercises to do to help finger hypermobility? Also recently we moved and don't have a great place to do school work. I have been having him kneel and do work on the coffee table. Should I be having him do work laying on his belly or standing at the dining table? What ways help stabalize the body while writing? I really wish I could bring him in for an evaluation, but it is too expensive without insurance. What does his overall pencil grip look like? Is he using a tripod grip or some variation of it? When you say he has hypermobility in his thumbs, do you mean he has a hitchhiker's thumb? Does he have hypermobility of any other joints or just the thumb? Is he pressing too hard on the paper as well? Does he "engrave" the paper and any sheets below it when he writes? I don't know of any exercises to do for hitchhiker's thumb. I have it and most of my kids do too. It really doesn't affect how any of us write in and of itself. If you could describe his overall grip some more or show a picture, it might be easier to suggest ways to help correct a too tight grip. When you say handwriting is a chore, what exactly is difficult about it? Does he not want to do it? Does he say it hurts or makes his hand tired? Is he still learning to write his letters or is he past that and doing copywork or his own writing? How long has he been formally writing for schoolwork? How much writing does he do for school or how much are you expecting him to write? Does he do any writing of his own accord outside of schoolwork? 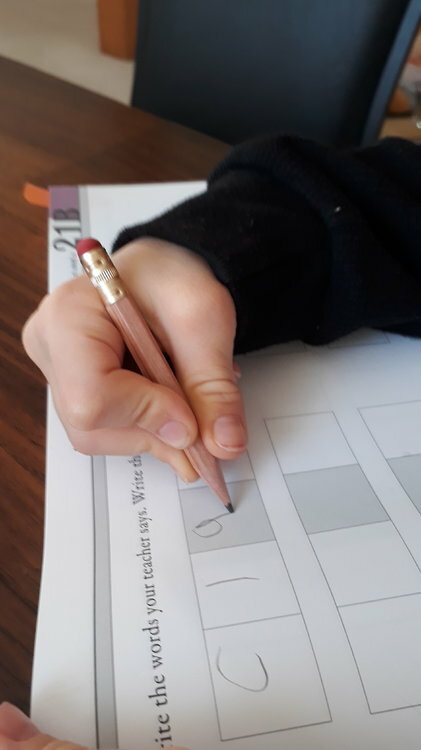 One possible way to help could be to share the pencil with him for writing assignments outside of handwriting practice. Basically, if the point of the written work is not to practice handwriting, you write some or all of it for him or do it orally. Six year old boys in general are not known for their fondness of written school work. Kneeling or sitting on his bottom on a pillow at the coffee table is fine if you don't have anywhere else to do school work so long as he is comfortable. Will he sit and play at the coffee table the same way with cars or legos or draw? If he is comfortable enough to do those things for any length of time then it's fine for school work. We don't currently have a dining room table or a coffee table so my 6yo sits on the couch and does his written school work on a tv tray or a lap desk or a clip board, whichever one he wants to use. While he was learning to form his letters, I made him sit at the tv tray for that schoolwork but once he could reasonably form his letters, I let him choose where he wanted to do his writing. I will take a picture and post it in a while. It is the hitchiker's thumb. He says it hurts and his hand get tired. All his joints are double joined. Even his hips! I say a chore meaning I have to correct everything all the time and it is just a mess. We used HWT in kinder so started when he was 5.5 he is now 6 turning 7 in two months. He knows how to form letters, but needs to really think it through. I have him doing simple copywork and no original writing on his own. He dictates his stories. In the last month I have him doing his own circling, checking and so forth in his ETC workbook we do 2 to 3 pages a day. He does not press too hard on the paper, just his fingers turn white from too much pressure holding the pencil. He hates coloring, drawing and writing. Never has he done these things on his own. He is comfortable at the coffee table kneeling. It is the hitchiker's thumb. He says it hurts and his hand get tired. All his joints are double joined. Even his hips! Hypermobility is known to cause joint pain because the ligaments that hold the joints together are either too loose to begin with or become too lax over time. Does he dislocate his joints often and/or easily? Again, I'm not aware of any exercises but I also have generalized hypermobility. That's not to say there aren't any, I'm just not aware of them. I will say that it can be very painful, I just learned to live with it but someone else might have some ideas for you If nothing else, I would ask his doctor at his next visit what they would recommend. I say a chore meaning I have to correct everything all the time and it is just a mess. We used HWT in kinder so started when he was 5.5 he is now 6 turning 7 in two months. He knows how to form letters, but needs to really think it through. I have him doing simple copywork and no original writing on his own. He dictates his stories. In the last month I have him doing his own circling, checking and so forth in his ETC workbook we do 2 to 3 pages a day. He does not press too hard on the paper, just his fingers turn white from too much pressure holding the pencil. Sounds like a typical 6yo boy to me but he has a death grip on the pencil. Have you tried giving him a wad of tissue or a ball of clay or playdough to hold while he writes with a pencil? That might loosen his grip a little. When you post a picture, there might be other things you can do as well. Does he have the same too tight grip on his eating utensils too? Probably has to do with his pencil death grip but not the end of the world. Some kids just don't enjoy these activities and there is nothing wrong with that. Only one of my 4 boys actually liked to color and only 2 of my six kids like to draw as a pastime or hobby. My 6yo, with a similar writing background to your son, is capable of writing sentences of 4 - 6 small words with me sitting next to him to guide him but on his own, he might (and that's a big might) write one or two words on a picture he has drawn. And his handwriting isn't nearly as nice when he does it on his own. 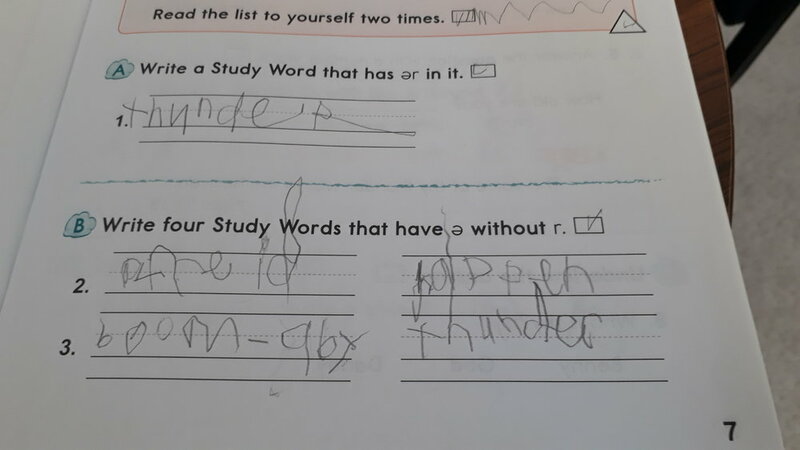 I know that there is a book about adult handwriting for disabilities so I am sure there is a grip that would work for this child that would be more comfortable than the one he is using. By grip I mean a way to hold his hand on the pencil not a purchased grip. How is this childs math understanding? how is this childs verbal expression? What about reading and articulation? Because if other areas are going well then I wouldn't bother with testing. I ask because if I were to spend any money I would save up and buy an ipad. 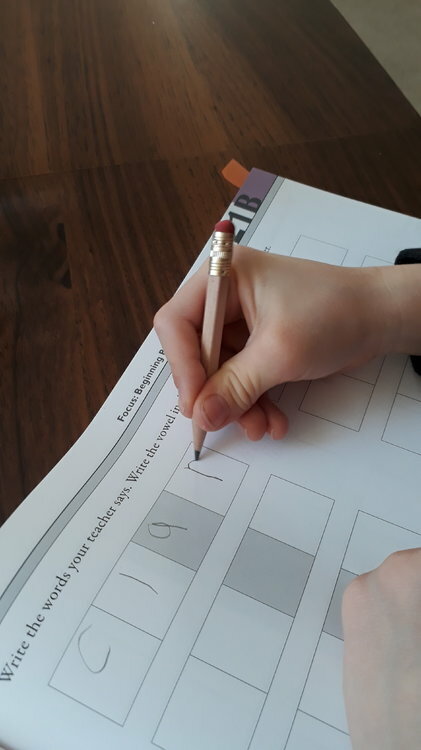 The dictation software is very good and there is also an app called myscript that allows a child to write with a stylus or even their finger and if the letter is even close then it fills it in and makes a page of text. My son has dysgraphia and we used that quite a bit for the past year with good success. The dictation wasn't as useful because he had pronunciation issues but now he has improved quite a bit. there may be software you could use with the existing technology you have if you post what you have maybe we could help. I would google every kind of way to hold a pencil and see if you can find a way that is more comfortable. Once he finds a way to hold the pencil that he can write without pain there will be a huge relief for both of you. My daughter uses the crossover thumb grip. I have tried to correct it for years but she writes fine and its going to just be that way. I guess I should ask if he has a grip that works now? I am sure someone could learn to type without their thumbs it is really only for the space bar. Could that possibly help as well? For my son he has a hooked grip with his right hand ( looks like a lefty but is a right handed hook) I have consulted a few OT's and a few handwriting specialists. One of them was incredibly helpful and told me how to position my sons paper so that he could see what he is writing. He slides his paper to the right and tilts it a bit. It made a world of difference. She also recomended THESE pencils and I really like them. Paper Mate 1862168 Mates 1.3mm Mechanical Pencils triangle shape, do not role and do not break. It takes some creativity and problem solving but honestly I wouldn't try to make a round peg go in a round hole. I would find a way to help him shine with his situation. I had my son do his school work on a paper taped to the wall or a whiteboard on the wall. I also bought a very inexpensive used drafting table and chair and worked with him on that as well. 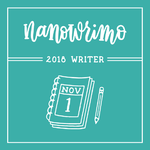 But the question of whether he could do nonfatiguing writing at small coffee table I honestly haven't tried. I know that even a pizza box can be turned into a nice lap desk because I have read about this being used as a creative solution in a handwriting book. please continue to post I am very interested in what solutions you can come up with. These may not all be related. But the two aren’t necessarily related. For example, Hitchhikers thumb isn’t necessarily painful (I have that), and not necessarily associated with weak thumbs. Are you in USA ? If so, I suggest trying to get any help you can from public school evaluation (free), and from his pediatrician to extent you can. Especially if there is something like rheumatoid arthritis or Ehlers Danlos going on so that the basic problem underlying this is medical, and if you have insurance it should be able to help at least to rule out some of the more serious medical reasons that could be underlying body wide hyper mobility and pain. Otherwise (or in addition) for the writing issue, I suggest following recommendations for dysgraphia. A soft pencil grip can help. I think Rainbow Resource has some. If I see one we’ve liked , I’ll link if I can. There have been several recent dysgraphia threads here worth reading. HWT didn’t fit my ds well. I also prefer Getty-Dubay. Or Zaner-Bloser . And print not cursive for us seemed better. pinch thumb and index finger together in round (like OK 👌 gesture) and work on strength isometrics. Don’t expect it to stop being hyper mobile. Mine has been hypermobile my whole like iirc. In every other area he is doing well. His vocabulary and speech are a little above age level. Math he is far ahead age level. Reading is solid at a first grade level. His current grip is sort of working. It is a lot better than it was at 5.5, but very sloppy and if I am not helping every second it is too sloppy to read. I was in the states for a short time. But was not able to get any help from the school district or from the ped. My hubby had help from ot as a child for his fine motor skills. So I hope it just the same thing and nothing else as well! I just don't have the resources for anything more. Can you post a photo of his grip and also of his writing? His own “sloppy” writing when he is doing his best with out constant correction from you. Could be that it is similar to your dh. He is only 6 going on 7. I’m not sure that many children that age write all that legibly. Some systems don’t even start children on writing (or formal academics) till 7. Ok I got some pictures of his writing. This is what his writing looks like if I am not helping him every step of the way. We have twice gone through HWT workbooks and weekly do chalk board wet dry try work. Here is another close one of his hand. When I tell him to hold the pencil correctly he holds it like this. Otherwise he changes it all the time. He gets halfway through writing a word and cracks his fingers and say they hurt. ok that was incredibly helpful. I am eating popcorn watching this thread because my son started with that exact grip. the hoook on the right hand. I was able to move that middle finger to a more proper grip but it didn't last. also honestly his writing looks very similiar. We worked on getty and dubay and that helped quite a bit because the letters flow ( y is the worst in HWT. he really really had a hard time with stick letters. ) Also that grip is tough to write HWT letters because they are straight up and down. Getty and dubay allows a more neutral wrist which improves flow and comfort. My son now writes without his hand getting tired but spacing and staying on the line is tough. the handwriting specialist recomended that I try the paper with raised lines but I thought they were kind of expensive and I am not sure how useful. First he probably needs a desk/kitchentable. writing surface because that hook makes it hard to see his work. Here are the tips that the writing specialist told us. her name is kate gladstone you can google her as she also might send you a book about this. She is the only one that told me the grip he was using would work with a few tweeks. First she told me to move the paper to the right a bit and always always have him use the helper hand on the paper to shift the papers she pointed out that his hand does not grow out of the center of his chest so since he writes with a bit of a hook I need to turn his paper and shift it to the right. Next shoulder writing really really really helps. also doing work on a board on the wall would help immensely. Or using wipeable markers and doing the work on a glass door might work. get rid of the traditional pencils. Try a foam wrap around a regular pencil or try those triangular pencils. We never go without them anymore. 1. Get him a full length pencil and pencil grips like I posted (pic bottom below if it posts) — As soft a lead as possible. 1 instead of usual 2 hardness if possible. 2. Separate penmanship from any composition work . If he is composing - even slightly, you do the physical writing for him. 3. For penmanship, step back to where he is copying models right there where he is writing. I suggest choosing between Getty Dubay and Zaner-Bloser. Level one (Lowest possible) which ever you choose. And or letter and tracing word copying books. (The following is inexpensive and could help develop stamina, but doesn’t teach a good writing form in and of itself. GD and ZB are both better IME. Forget about your ds having done whatever he did with HWT. He isn’t ready for writing without a model to copy. 4. Do an amount that is comfortable for him — maybe 5 letters to start out, but do it three times in the day. The next day try for 6 letters 3 times per day. Gradually build strength and stamina. 5. Consider getting him started on http://www.talkingfingers.com read, write, type program. yes all good ideas Personally the papermate pencils worked for us after all other pencil grips and holders failed. Whatever he is willing to do consistently to get enough repetitions in I say go for it. I think getting in a good writing position is important so the shoulder can work and the helper hand is in place. Some people really like to raise the writing surface with a drafting desk or large binder. I didn't find that helped with the hooked holding. For practice I would go further. I would even separate unique and novel words from handwriting skill work. Keep it repetitive so the mind has time to anticipate the word he writing and build a motor pattern for those letters. Part of the challenge I found with my own son is that we seldom wrote the same sentences daily so each day his brain had to rethink those letters. This month we came up with 5 sentences of his choosing that included all letters of the alphabet. then each day he writes those same sentences on level 1 paper to work on spacing, alignment, shoulder stability , helper hand. Adding spacing, staying on the raised line. We are only on day 12 and plan to do 30days (1 page/per) of this work then isolate letters that need help one more time. yes all good ideas Personally the papermate pencils worked for us after all other pencil grips and holders failed. We had tried the papermate 1.3mm mechanical pencils before they were mentioned in this forum and they literally fell apart on us. (Erasers and leads would not stay in) Maybe we had a bad batch, or an earlier less good version. Whatever he is willing to do consistently to get enough repetitions in I say go for it. I think getting in a good writing position is important so the shoulder can work and the helper hand is in place. Some people really like to raise the writing surface with a drafting desk or large binder. I didn't find that helped with the hooked holding. For practice I would go further. I would even separate unique and novel words from handwriting skill work. Keep it repetitive so the mind has time to anticipate the word he writing and build a motor pattern for those letters. Part of the challenge I found with my own son is that we seldom wrote the same sentences daily so each day his brain had to rethink those letters. This month we came up with 5 sentences of his choosing that included all letters of the alphabet. then each day he writes those same sentences on level 1 paper to work on spacing, alignment, shoulder stability , helper hand. Adding spacing, staying on the raised line. We are only on day 12 and plan to do 30days (1 page/per) of this work then isolate letters that need help one more time. That sounds like a really good idea. Yeh I don't like the erasers either. They fall out in my sons backback. I keep meaning to try a glue gun and put a dab of glue on the eraser. I tried super glue and it didn't work. the Foam Grip Tubing and the egg pencil grips but initially it was a total fight the entire way to get a pencil to stay in the hand in the proper position. For whatever reason those papermates 1.3mm provided the structure and the consistancy as they couldn't be moved or slid. In hindsight my son really had a few sensory challenges with writing implements. He hated crayons as they were too slick. He eventually grew out of that. For a pen he likes a Uniball Onyx Rolling Ball Pen.7mm, he would like the 1mm even more if I could find it. HE says they feel more like a pencil and he can't handle the glide and speed of a true ball point pen. I think a foam grip on one of those would also be useful. I have always had the hyper bendable joints situation—even more than @lulalu ‘s photos show for her ds. 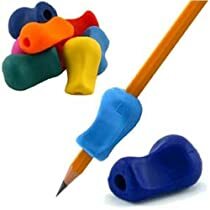 I have found the pencil grips I put pic of hugely reduce writing fatigue.